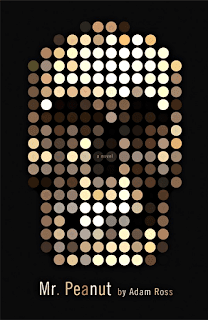 Adam Ross' debut novel Mr. Peanut is extremely original and in a class of its own, with style that reminds me faintly of Chuck Palahniuk . The audience will be caught off-guard and lost in the enigma that is Mr. Peanut . David Pepin is endlessly devoted to his wife of thirteen years, Alice. Despite their constant relationship ups and downs and Alice's obsession with eating and then losing weight, David has done almost everything imaginable to ensure her happiness. When Alice is found dead after ingesting peanuts which she is publicly allergic to, David becomes the prime suspect in this apparent homicide. The detectives assigned to David's case have their own history with marital problems and as both the "crime" and story unravel, the line between reality and fantasy begins to blur dramatically. Mr. Peanut contains so many clever components on a variety of levels and will cause intellectuals to really appreciate this novel. Numerous references to Alfred Hitchcock and artist M.C. Escher are hidden within the plot and referred to throughout the novel, in addition to metaphorical clues and symbolism you'll be able pick up on if you're truly involved in Mr. Peanut . Adam Ross is extremely creative and has developed strong characters that are witty and hilarious. There are many "shock value"-worthy statements made by David Pepin and the two detectives that really make their personalities vibrant, intimate and real. Mr. Peanut is easy to get lost in, and the world around you will fall away while you read this book! The plot truly "unfolds" and none of it is predictable, making for a reading experience worth your time. I'm eager to keep tabs on Adam Ross in the future, and am looking forward to his next novel! Fans of Mr. Peanut will also enjoy the following works by Chuck Palahniuk , most specifically Invisible Monsters (1999) and Diary (2003).